Any comments on stands, or recommendations? +1 for Ikea. 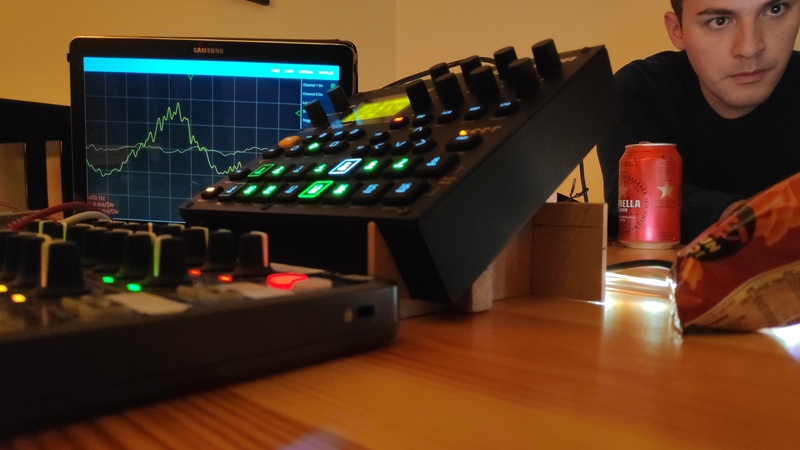 Tablet stands for small Elektron. 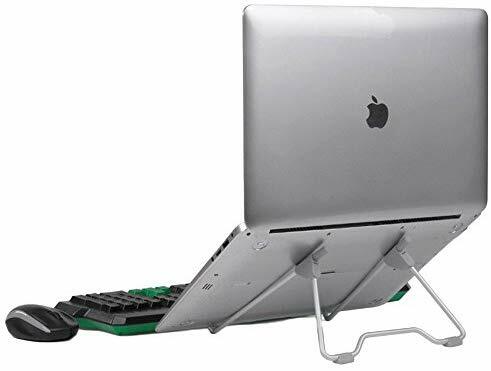 The laptop stands for bigger. I tried the MDS-100 stands from Ultimate Support but they smelled toxic and made the whole studio small like a toxic waste dump. They were also covered with a black residue / dust that I couldn’t ever seem to clean all the way off. They’re a great design but avoid at all costs. I have these, the two tier setup, and do not share the same experience. No smell, no residue. The are super sturdy and the lock in system is very useful. I was actually going to recommend them. 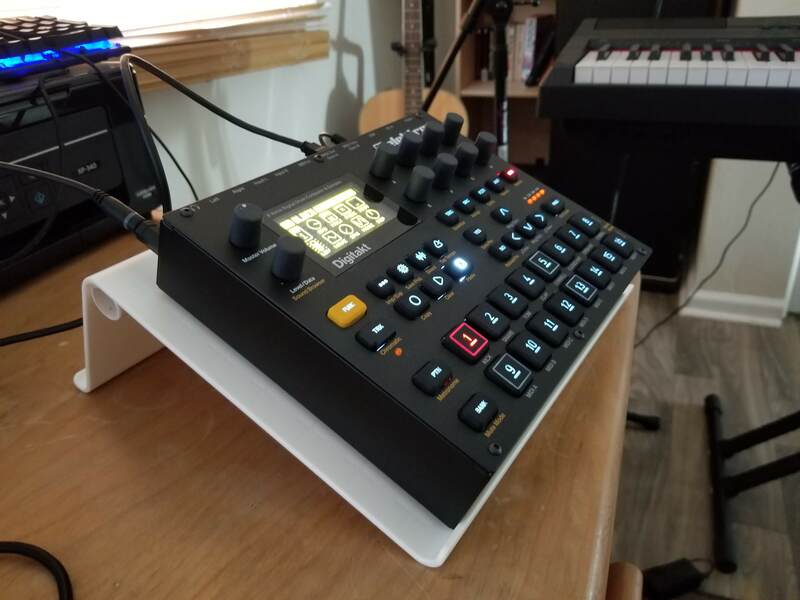 Also for OP, KV Gear makes some nice inexpensive stands that fit a variety of products including the digitakt. I have the ikea stands as well, they are not bad at all. I put a bit of felt on the lip to avoid accidental scratches. As well as little rubber dots for anti slip feet. 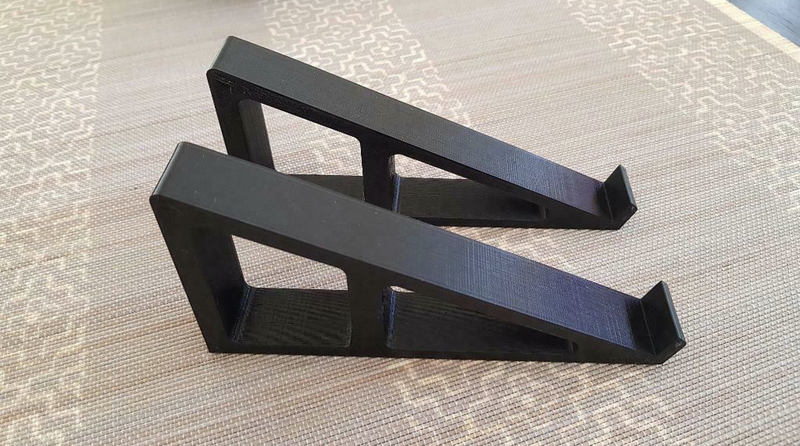 I have a pair of the IKEA stands for my DT and AR, but use with the AR suffers from the flexibility of the stand which gives way quite easily when pressing the pads - especially in performance mode. I guess the effect would be amplified in a more stressful/ enthusiastic situation e.g. playing live. I found a tilting VESA mount on eBay for 17€ which is incredibly sturdy (it’s made to take up to a 27" screen) and can hold the DT vertical if you wish. It certainly raises it more than high enough as well. Also made one from three pieces of interlocking 3mm MDF sheet. It folds flat, but is a bit weak for repeated use. I picked up some 3D-printed ones from a local seller. 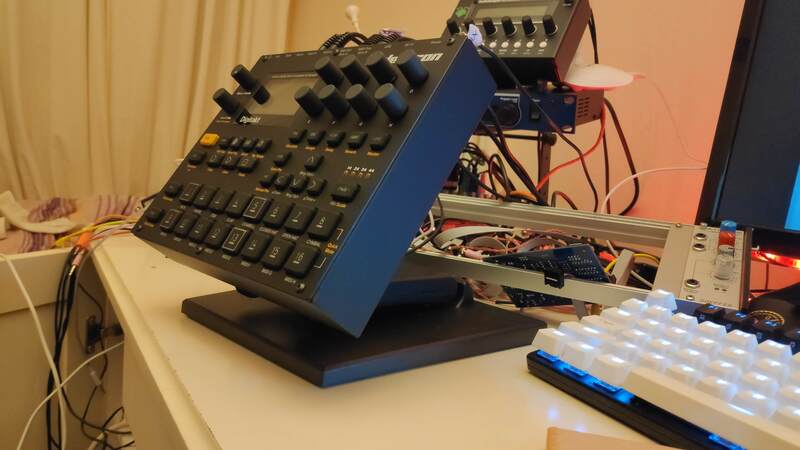 You can join them with a strip of wood, or use Velcro to hold them onto the Octatrack. Ikea = top & cheapest! If I’m mobile disco i use the desksaver as stand. I have the Fraction Industries ones - Spenny, but lovely. I use a ring binder folder which works perfectly. I have similar stands, maybe from same seller. I made little modification and added four small magnets to it. made my self one out of thick cardboard and a glue gun few weeks ago , works a treat! 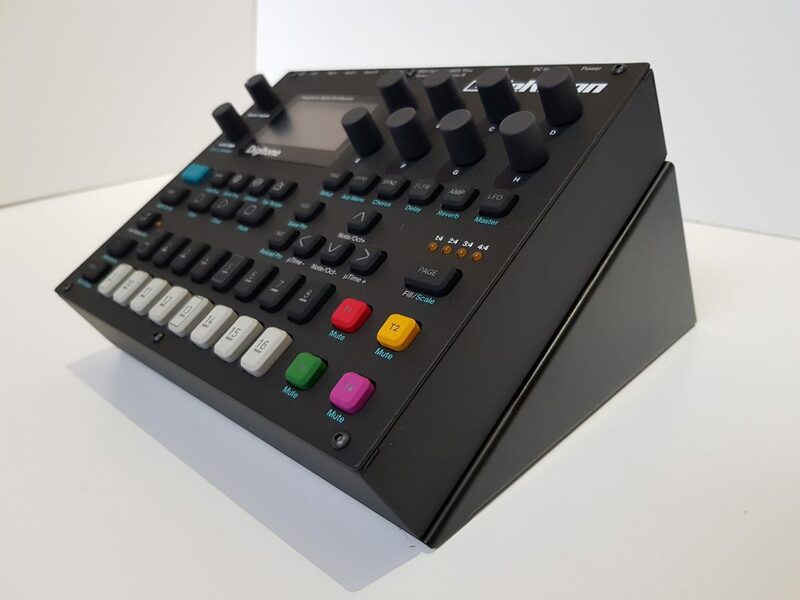 Elektron Digitakt - Digitone - Analog Heat desktop stand,Professionally designed and manufactured with a matching matt black powder coated finish, all screws and fittings supplied. I have a few of the ikea ones - but cut the back down with a table saw. Then I added some anti slip carpet tack material to stop them from slipping. Ok - I got the Ikea stand, and it’s quite nice. I added a small PVC brace with epoxy, and now it’s perfect.